Normandy Life: Rain, rain and more rain. It's been raining nonstop it seems since Christmas Day, but it isn't cold so I shouldn't complain. 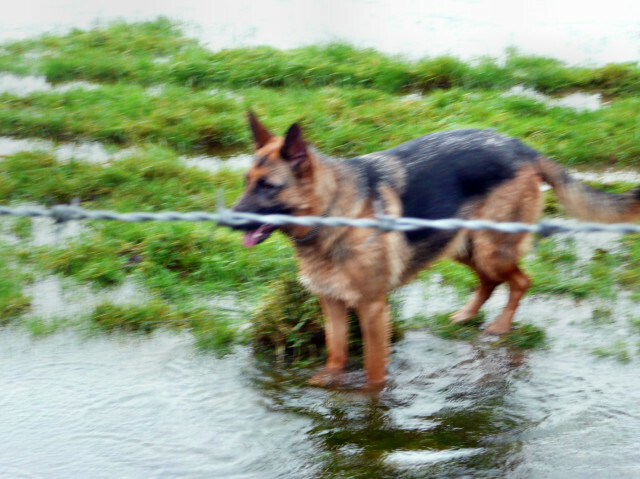 On New Year's Day we took a walk down by the river but soon discovered the water level had risen so high that the surrounding fields were flooded. No surprise really, it happens every January. What made this year different, though, was M'selle Fleur who hadn't experienced flooded fields before. She's a real water baby, she ran and splashed around for ages. 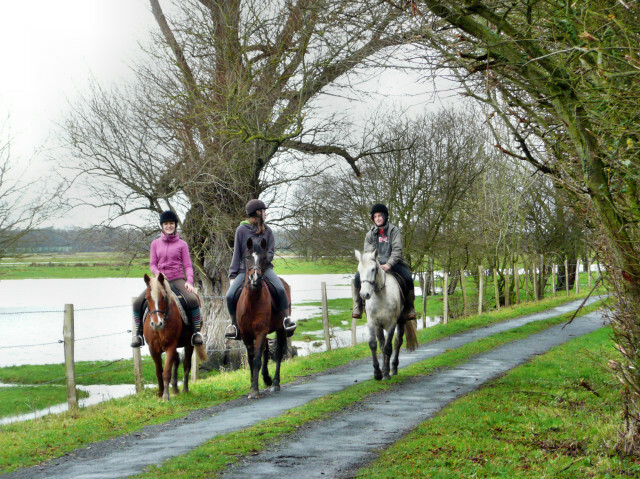 On the way back to the car we met three young ladies out enjoying a gentle hack, we exchanged several pleasant Bonne Année 's. 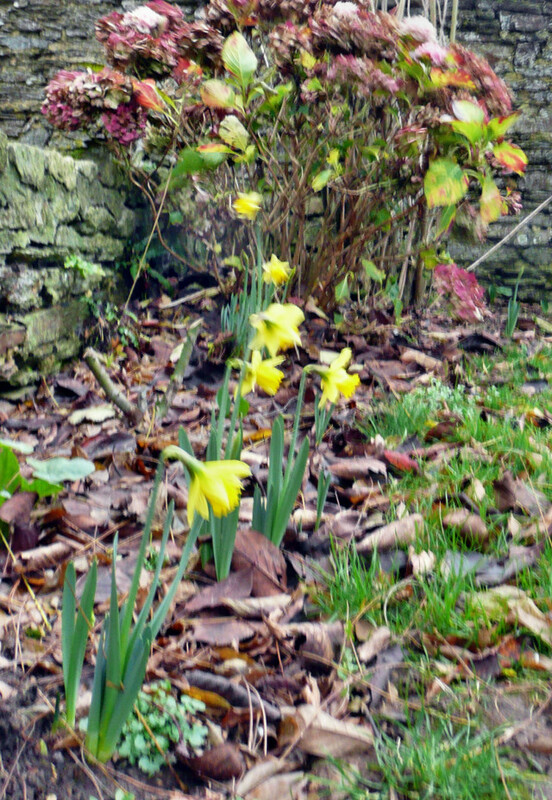 The winds were practically gale force this morning when I bolted outside to take my daily daffodil shot. They were all dancing around in the wind so the shot is a little blurry, I'm afraid. So, I think I'll be staying indoors for the rest of the day, perhaps I'll even take a snooze with a favourite Ted and this very special hot water bottle, a wonderful Christmas gift from the ever thoughtful SP. Linking this post to Bunny Jean's Wednesday's Bunny Hop party. Hope you're safe, warm and dry today, wherever you are. 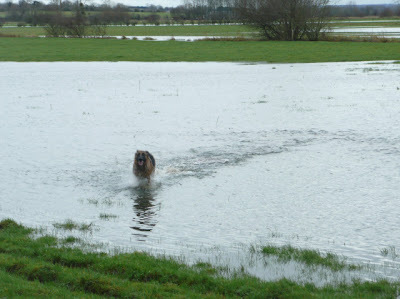 It looked like a lovely walk in spite of the rain and flooding...Fleur seems to have enjoyed his little swim! She really has grown! Our weather has been frigid but still, little snow. It is only 13 degrees today...brrrrr. I need your teddy and hot water bottle, Maggie!! A snooze with a special hot water bottle sounds lovely! I'm heading back to work today - reluctantly. It's raining here too, but I'll be indoors right through it. Last night and this morning the wind and rain here in the UK was very full on, I believe from the News that lots of trees were down all over. We have had some sunshine this afternoon, but the wind is still there. Lovely pics - especially Fleur in the rising water and the riders. As for the hot water bottle -love that cover - I just started using mine a couple of nights ago now it's starting to cool off here. Best Winter warmer invention ever because the room can remain cool, yet the bed, and my feet, remain snug and toasty! See the Devon coast is also getting blasted today. Maggie, Fleur does seem to be the "water dog". It's rainy and windy here these days, too. But so mild. Love that hot water bottle cover! But the pictures of the dog and the daffodils made me glad. So, thank you. A snooze on a rainy cold day sounds like a good idea to me! I love to cuddle up on the couch with a book when it rains. Thanks for joining the 366 challenge. I know we are all going to feel relieved to get some of the unwanted and unused clutter out of our homes. Rain here all day too Maggie and storm. The dog loves the water lol how lovely. Awwwww. 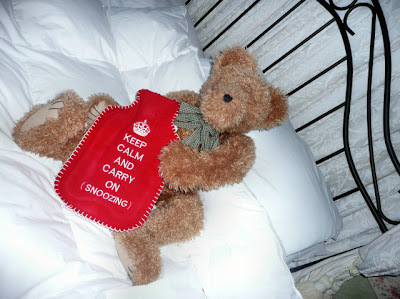 Love the teddy/hot water bottle. Hope you did stay in where it's nice and dry and warm. Your countryside looks beautiful rain or shine and I bet Fleur likes the rain just fine. Your little teddy and hot water bottle should keep you all cozy. Just grab a good book and some tea and you should have a great afternoon. Btw... it was another great 80 degree outside today and I had to do indoor stuff! Go figure.